I can't think of an instance when we wouldn't be. If you follow sports (and specifically the Packers), you may have heard of Randall Cobb. He played football with my 2 oldest boys. He's the only one I can think of. In fact, tomorrow, we're having ranch pork chops: Pork Chops, a packet of dried ranch dressing, and 2 cans of cream of chicken soup. I'm really liking that after the time is finished, the temperature switches over to "warm" so the food doesn't dry out. I haven't really thought about it. I know some people get really freaked out about it, but I'm indifferent to it. Figure skating. It's so beautiful, and it's inside. I have no desire to go to Russia, especially after going to the former East Germany last summer. I don't really have any desire to go to the Olympics. I'm fine watching it on tv. This is from my college years, but it's the only one I could come up with! I was a little sister for a fraternity in college, and we played intramural basketball. We had one game that came down to the wire. I had the ball (right around mid-court), and we were down to the last second. I had no one to pass to, and everybody was yelling, "Shoot it!" So, I shot it and it went in. The coach yelled, "Hail, Mary!" (although he may have actually meant a different form of the word "hail"!) I have no idea how that ball went in. I'm definitely not a basketball player! Why am I drawing a blank on this one??? Weird. OS made it to his destination okay, and I'm resting easier knowing he's there. It's a little strange to think that he's so far away...he's been 2 hours away for the past 7 years; now he's all the way across the country. On a different note: did anybody watch Catherine & Sean's wedding on tv? If you did, did you think it was a little strange that she walked down the aisle to 2 cellists playing Michael Jackson's "Human Nature"? Strange. Just strange. Wow! You were the "hero" of that basketball game! I'm sure that was very exciting! Sorry - I don't even know who Catherine and Sean are. From what show? I did watch Sean and Catherine's wedding, but I didn't realize that was the song that she walked down the aisle to...kind of strange, I'd say. It was such a beautiful event, though! Glad your son made it safely to his destination! I know what a relief that is for you! Glad to hear that OS made it safely to Utah. I enjoy the Olympics, but I won't go out of my way to watch the events ... and if there's something else on that I'd rather watch (like NCIS ha! ), I will watch it. Figure skating amazes me but I find myself always having to squeeze me eyes shut when they do some of their more difficult moves. I love my slow cooker, glad your enjoying yours. What an awesome story with you making that shot! Happy to hear that OS made it safely. Glad you enjoy your new slow cooker. I love mine. Glad to hear OS made it safely. I agree with you on your random comment. Weird. Okay, I am stumped. Who is Catherine and Sean? Glad OS got to his new home fine. What a cool story about making that basket; probably would never happen again, but at least it happened once in your life time. 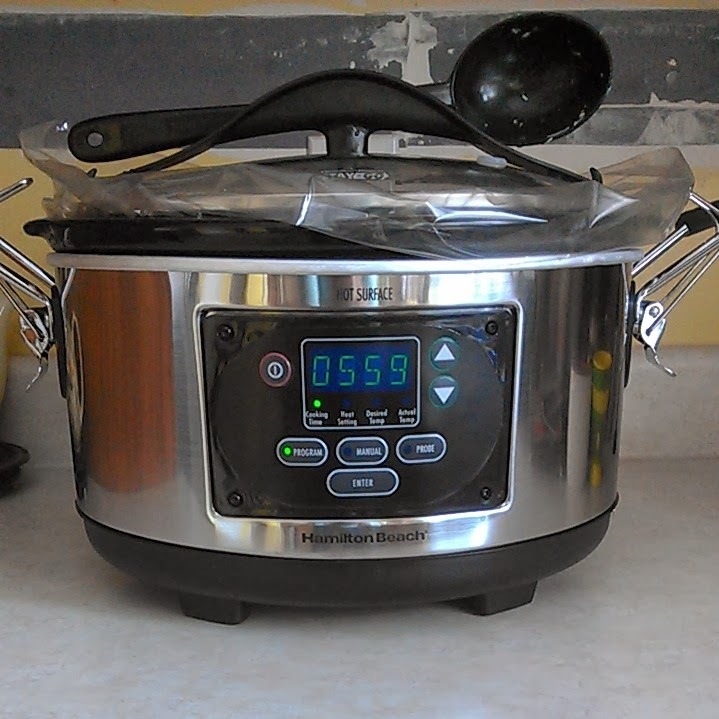 Love my crockpot, I like yours with the switching over to warm mode!